If international regimes did not exist, they would surely have to be invented. Undisputedly, the realist paradigm dominates any debate in International Relations. “Realism has dominated international relations theory at least since World War II.” It is therefore obvious to begin the search for an explanation for the growing number of international regimes and states’ willingness to participate in them within realism itself. Yet, how can realism, that regards states as sovereign units concerned primarily with their own security and survival in an anarchic international system, account for extensive cooperation in regimes? In order to assess whether realism provides a suitable explanation for the obvious success of regimes, this essay shall compare the realist approach to the neo-liberal account of regimes. Although the existence of international regimes is acknowledged by neo-liberals and realists, the two groups have competing theories about the formation of those regimes. 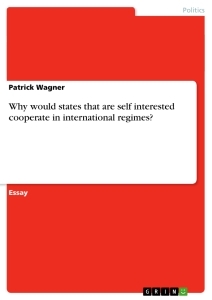 Having looked at these two different approaches to explain the existence of regimes, this essay shall argue that the notion of ‘self-interest’ is, perhaps surprisingly, the very reason why states would want to participate in regimes and not at all an impediment, as the question suggests. However, the realist explanation of regimes does not stress the importance of states’ self-interest as a cause for regime formation. It is the neo-liberal regime theory that holds that self-interest is a motive for states to cooperate in regimes. Hence, this essay will conclude that the realist theory does not provide an accurate account for the creation of regimes and their durability. Regimes can be defined as implicit or explicit principles, norms, rules, and decision-making procedures around which actors’ expectations converge in a given area of international relations. Principles are beliefs of fact, causation, and rectitude. Norms are standards of behaviour defined in terms of rights and obligations. Rules are specific prescriptions or proscriptions for action. Decision-making procedures are prevailing practices for making and implementing collective choice. Krasner’s definition leaves no doubt that the idea of a regime goes beyond that of a simple set of rules because a regime also provides ‘decision-making procedures’, which requires “quite a high level of institutionalization.” Institutionalisation is commonly seen as a feature of organisations and therefore one might be tempted to equate organisations and regimes. However, although organisations as well as regimes are indeed international institutions, they are far from alike. Perhaps the most fundamental difference between regimes and organizations –both of which can be seen as representing a type of international institution– lies in the fact that regimes […] do not possess the capacity to act, whereas organizations can respond to events […]. Although not only does classical realism not explain the existence of regimes but denies its workability, and only neo-realism does acknowledge and attempts to explain the existence of regimes, the literature rarely makes reference to this distinction. The term ‘realism’ is thus used in this essay throughout. This essay acknowledges that “liberal co-operation theory and realism are not the only approaches for understanding international regimes, even if they are the most prominent.” (Stephen D. Krasner, “Sovereignty, Regimes, and Human Rights”, in: Volker Rittberger (ed. ), Regime Theory and International Relations, Clarendon Press, Oxford, 1993, p.141) However, there will be no space here to discuss any other regime theory. Compliance in International Relations. Key to Effective Controlling of Pollution by Environmental Regimes? International Relations: What kind of impact has the information revolution had on state sovereignty? Would you argue it has increased or decreased the power of the state? Why or why not? International Organized Crime Affects State Authority. Reason Enough for War? How can International Management Theory contribute to International Management Practice? To what extent is realist theory an adequate tool to help us understand international relations in the unipolar post-Cold War world?